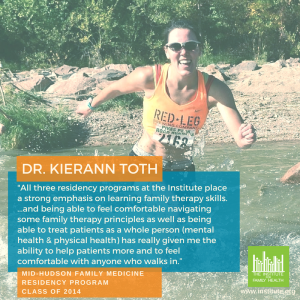 Dr. Toth graduated from the Mid-Hudson Family Medicine Residency Program in 2014. In her third year of residency she was selected as one of the top 12 residents in the country for the AAFP Award for Excellence in Graduate Medical Education. “All three residency programs at the Institute place a strong emphasis on learning family therapy skills. The problems we encounter have a lot of family dynamics at play and being able to feel comfortable navigating some family therapy principles as well as being able to treat patients as a whole person (mental health & physical health) has really given me the ability to help patients more and to feel comfortable with anyone who walks in,” said Dr. Toth.